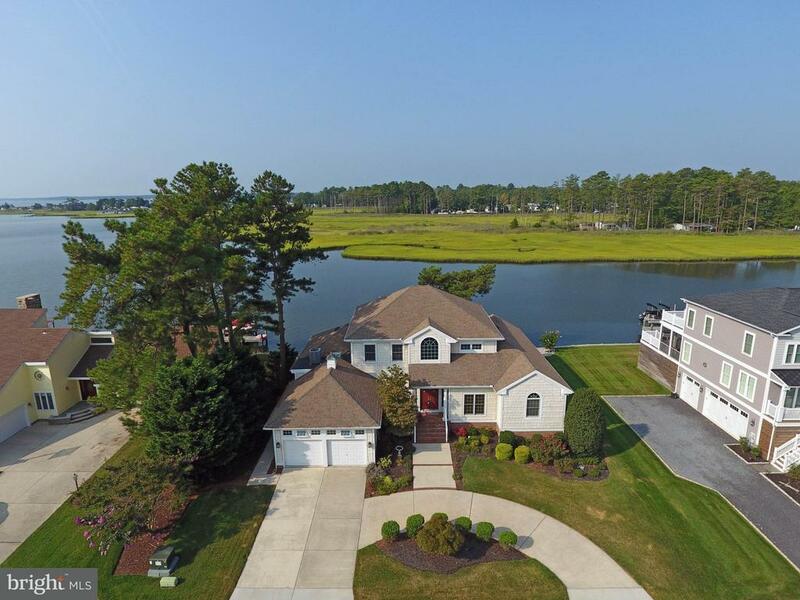 Beautiful WATERFRONT home in prestigious Rehoboth Beach Yacht & Country Club. Hardwood floors throughout. So much entertaining can be done in the spacious, eat-in kitchen with a granite island countertop, Wine Cooler, Pantry, oversized kitchen sink, Jenn Aire cooktop and convection microwave. Formal dining room with built-ins, chair rail, and crown molding is just perfect for hosting special dinners. Comfy and cozy Family room has gas fireplace, lots of windows, built-ins, ceiling fans and a sound system. Master bedroom has a tray ceiling, two walk-in closets, and built-ins. Master Bath has a separate shower, Lasco whirlpool tub, and lots of closet space. Youll enjoy working in the office with recessed lights and more built-ins. Upstairs bedrooms are bright and cheery, and there is a bonus sitting room for additional quiet time. The sun room overlooks the expansive bay waters, and you might find it hard to leave this peaceful retreat. After you have thoroughly enjoyed walking through this great home, enjoy the exterior landscaped lot with circular drive and electrically controlled power lift for your boat. Heating and air systems were replaced 2 years ago. Walk-in attic spaces are floored. It doesnt get any better than this. Dont wait to see this. Schedule your appointment now!